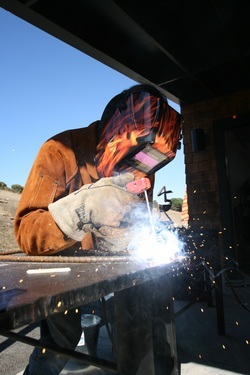 One object for you to do when becoming familiar with welding would be to learn the basic definitions of terms dealing with welding. This can be done by purchasing the Standard Welding Terms and Definitions from the American Welding Society's website. You can also purchase used copies from other sites like Amazon. Another good resource to have would be to get the book Modern Welding Technology by Howard B. Cary and Scott Helzer. The Sixth Edition of this book also contains some of the basic definitions and slang terms dealing with Welding. If you are interested in getting more information on the welding subject and also receiving a Welding Journal published by the American Welding Society, you can become a member at the AWS website.